Outfit your rugged, reliable truck with unparalleled convenience. Mounting a bed cover to your F150 protects your gear from inclement weather while also guarding against theft. Your cargo will remain safe, and your truck will look good. Tonneau covers also increase gas mileage, saving you money at the pump. As far as truck accessories are concerned, a tonneau cover is about the best way you can go. Tonneau covers may be pricey, but they provide pickup drivers like you with a great deal of value. A Ford F-150 tonneau cover rewards investment by actively saving you money on gas. Similarly, they potentially prevent raised insurance premiums and a need to buy new gear resulting from theft. These bed covers fit Ford's most popular model pickup truck exactly, and pay for themselves in the long run. Carting your gear in a pickup truck is handy and convenient, but it can also put your cargo at risk. Rainfall and dust storms can ruin your tools and electronics, while burglars can up and steal them when the time is right. The good news is, a bed cover for your f150 provides a reliable shield of protection against the elements, and our folding, and hard top models even turn your truck bed into a locking safe so thieves can't get in. Luckily for you, AutoAccessoriesGarage.com has a wide selection of F150 tonneau covers to choose from. Whether you want retracting, folding, or roll-up styles; we have what you need at the price you're looking for. Best yet; every F150 tonneau cover ships to your door for free! When you shop with AAG, you're also getting the best price around. To prove it, we offer an industry leading 1-Year Price Match Guarantee. That means if you find a tonneau cover, or any accessory for your truck cheaper elsewhere, we'll beat that price by $1. Also, if you find it cheaper after your purchase, we'll protect that price for up to a year after purchase. Thousands of real customer reviews, hundreds of covers to choose from, and an Industry-leading customer service; see why AAG is the best choice for you and your F150. The style, brand name, and model of your new truck bed cover will inform the way it should be installed on your Ford F150. But while you shop for the perfect tonneau, we’d like to tell you about the most commons styles of truck bed covers to install on an F150, and how to install them. Clamping covers usually require no tools whatsoever. All of the necessary attaching fixtures are built right in and usually can be operated by hand. Always start by locating the manufacturer’s instructions. They should let you know if you’ll need any additional tools, though tools generally aren’t necessary for installation a temporarily clamping cover on a Ford truck. 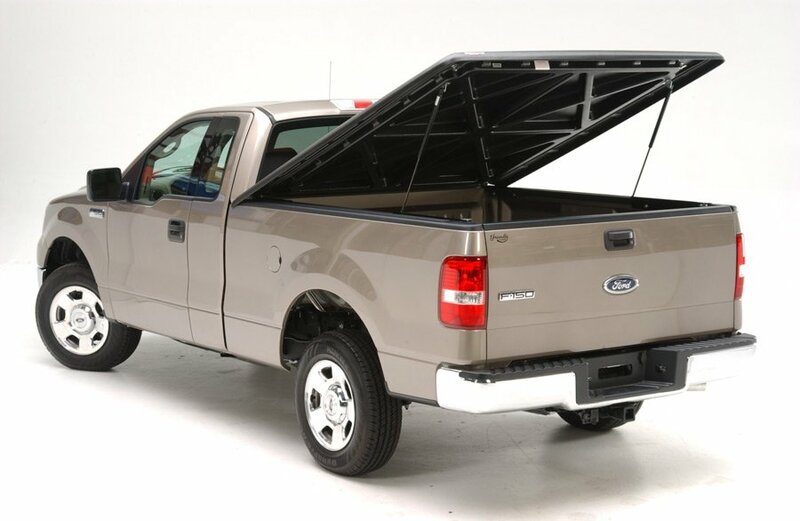 Place the tonneau on top of your F150’s bulkhead, as close to your cab as possible. It will probably be rolled or folded in the box, and it’s best to keep it that way as you put it in place. After ensuring the cover is straight, you should be able to pull down each clamp, and tighten it against your Ford F150’s bed rails. Now, unroll or unfold the cover across the length of your F150’s bed. At the end of your cover, near your tailgate you should now be able to tighten the rear latches in the same way you tightened the front clamps. Close your tailgate to ensure that nothing is in the way, and you’re done! Retractable truck bed covers are a great compliment to your Ford F150. All tonneau covers vary, so first you’ll need to locate the instructions and gather the necessary tools. 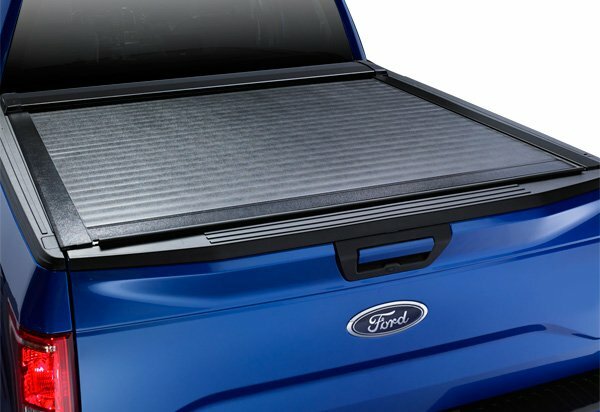 Every retractable truck bed cover has a canister that you’ll want to place in the middle of your Ford F150’s truck bed. The canister being centered is the most important part of this installation. 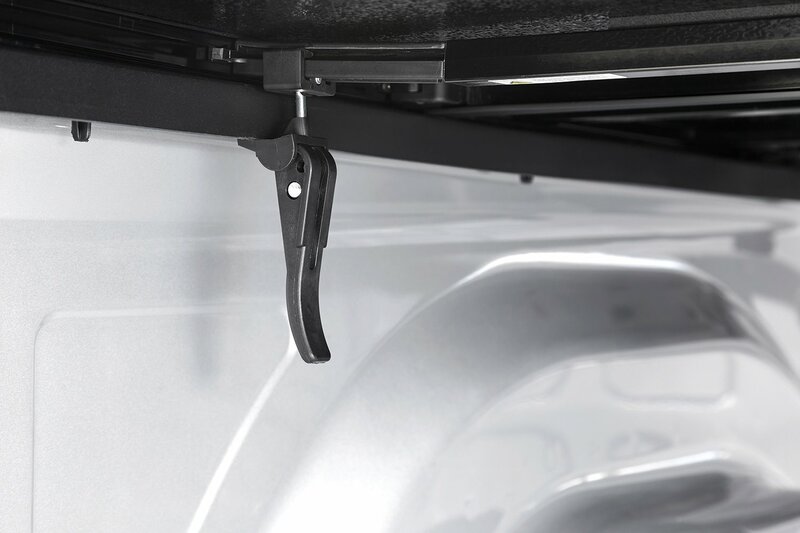 Retractable covers tend to include their own rails, so you’ll want to lay those down on top of your F150’s rails and attach them to the cannister. It’s essential that every component is in the right position. Construct and place each clamp as outline in your retractable tonneau cover’s specific instructions. Now’s your chance to install any included pull straps, drain tubes, or electrical components. Once you’ve tested that everything is operating correctly, you’re set! A hinged lid truck bed cover is a solid, one-piece slab that opens with the aid of shocks. As always, open the box and take a look at the manufacturer instructions so you can determine if you have all the tools you’ll need. You’ll probably need some helpers to help you lift it onto your Ford F150’s bed. It’s also smart to wipe down your tonneau and your ford with alcohol on the parts where tape will connect. Ensure with the cover in place, that your gate still opens and closes. Crawl under your tonneau and attach the included c-clamps as directed in the instructions. Prop open your cover, you can do this by laying on your back and pressing up with your feet but it’s easier to have some helpers with you. With the cover up, you’ll be able to attach the bottom of the shocks to the appropriate knobs in your cover rails. Now you can tighten all of the nuts, bolts, and gaskets and do your final inspection! More Popular F-150 Accessories: Ford F-150 Trailer Hitches, Ford F150 Headache Racks, Ford F150 Tow Bars, Ford F150 5th Wheel & Gooseneck Hitches & Ford F150 Retractable Tonneau Covers. Like the cover a lot. Wish it was a inch or so longer. It looks short. Read more TonnoPro Tri-Fold Soft Tonneau Cover customer reviews. Worked as advertised! Completely happy with the product. Installed on a 2014 F-150. Nice cover for the price. Looks just as I expected. Arrived quickly and installed in less than 10 minutes. The only NEGATIVE thing about this cover is the gap at the front corners of the bed, which makes it not seal well and allows a lot of wind to enter. AutoAccessoriesGarage.com does offer a modification for this by moving the support rail back toward the rear of the box. If you are looking for a nice cover this is it, if you want to do the modification, if not, this may not be the one. I enjoy it, it looks sharp and fits my intended use.